I’m not sure whether I like current-events-themed promotions because they are effective or because they make for timely blog posts (probably the latter, but I’ll continue to believe in the former). While it seems that banks have been dropping the ball on the year-end holidays, I was pleasantly surprised to find a bank doing a full-court press around March Madness. It’s an annual tradition of binge sports watching as the top 68 U.S. colleges play a single elimination tournament during the last 3 weeks of March. STAR Bank ($1.6 billion in deposits) has a homepage-dominating ad for Game Time, a debit-card sweeps during march (see above). Cardholders that conduct at least 17 transactions are automatically entered to win one of five $100 statement credits. Customers can also enter the contest online, a user-friendly way to comply with U.S. sweepstakes rules (see bottom of landing page below). 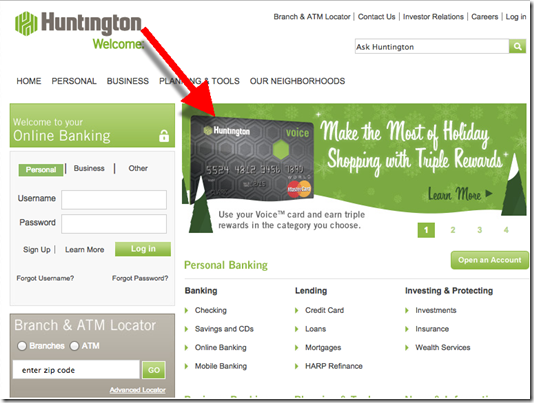 Bottom line: The graphics are eye catching, the timing is perfect, and it’s easy for customers to participate. My only concern would be the size of the prize pool, which is only $500. For a month-long sweeps, there should be a bigger grand prize. How about this? A sweet sixteen earning $100 each, a final four winning $500 each and a champion taking home $1,500. Principal of BUX Advisors, a financial services UX consultancy. I’ve been slightly obsessed with holiday-themed marketing, actually the lack of it, over the years. 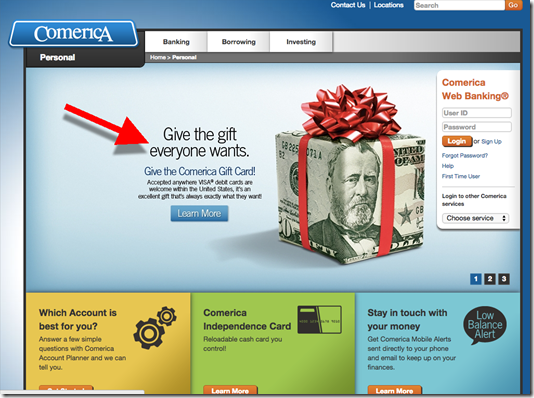 It’s not that I think putting a bow on your website will magically improve your return on equity (ROE). It’s that by not doing anything, it seems like you are just not trying. You put holiday decorations up in branches, why wouldn’t you extend that same thinking to your digital look and feel? And it doesn’t have to be an extra cost (like those in-branch decorations). 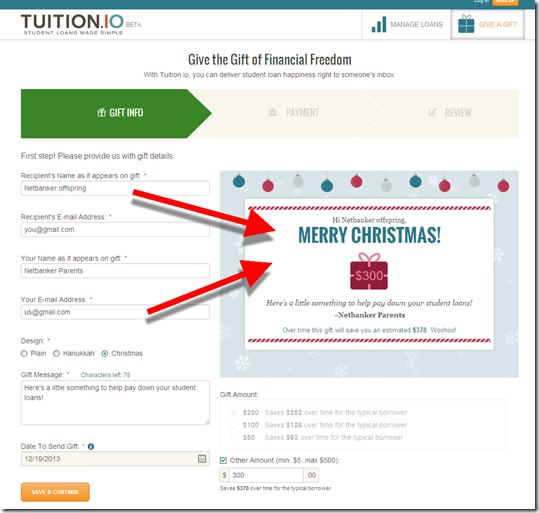 You can push holiday-themed promotions to cover the costs of the website changes and then some. One example, primarily offered by U.S. credit unions, is the so-called Holiday Loan (see other examples in our past coverage). These are small (usually under $5,000, sometimes just $1,000) unsecured installment loans to help families with surging holiday expenses. These loans typically must be repaid within 12 months so they are not outstanding next Christmas. 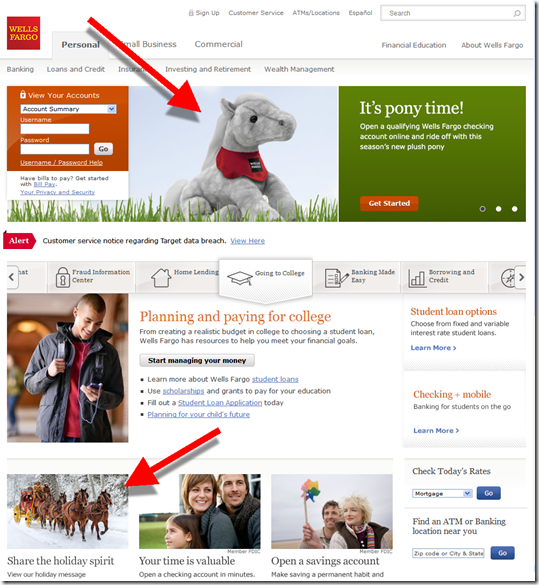 In poking around the web this afternoon, we saw a number of examples at credit unions (and the lone bank). My favorite was this promotion from MembersPlus Credit Union, a 10,000-member CU in the Boston area. 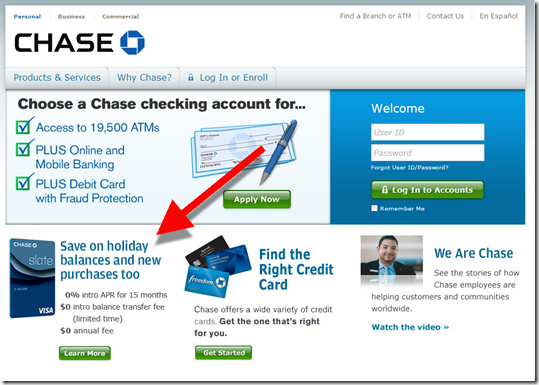 Its Holiday Loan is currently featured on the homepage with a good supporting holiday graphic. The 7.99% APR is fair and undercuts most bank revolving credit and the 1-year payback schedule is good for helping members repay the debt before it becomes a burden a year from now. The maximum loan amount is $5,000. Have a great weekend and don’t forget the hot chocolate! The MembersPlus homepage currently displays an eye-catching promo for its upcoming Member Appreciation Days (promo #1 of 3 in rotation). If there’s one thing Americans can agree on, it’s honoring and celebrating the service of our veterans both past and present. Given the contentious election week in the United States, you’d think U.S. financial institutions would be rolling out the red, white and blue on their websites on Veterans Day today. But there was surprisingly little activity at the major banks. Most had the same old-same old on their homepages. Even Navy Federal Credit Union passed on adding anything extra for the day. 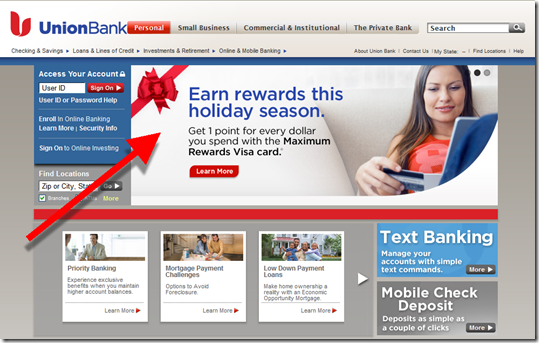 The only top-50 banks with Veterans Day graphics were Bank of America, Zions and of course USAA, all displaying page-dominating graphics on their homepages (see below). We also looked at a few credit unions (at random) and found BMI Federal Credit Union and PenFed honoring vets (see below). While I have taken banks and credit unions to task for basically ignoring the December holiday period, the real missed opportunity is not Christmas, but New Years. The annual calendar reboot is the time when people are most likely to be thinking about their long-term finances. Three years ago, I found only one example of a new year’s message among the largest 80 banks and credit unions. This year I looked at a few dozen websites more or less at random and again found just a single “look at your finances” message. 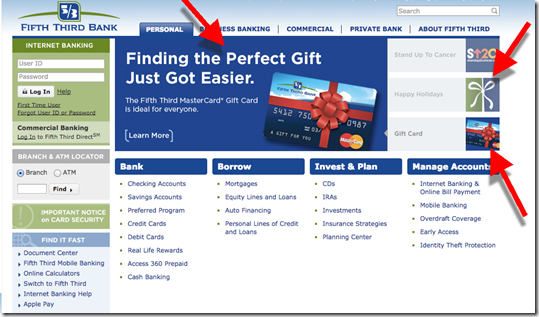 Webster Bank not only showcased a page-dominating “financial checkup” spot, but also incorporated the message into their main pull-down (mouseover) “Bank” navigation (see first screenshot below). 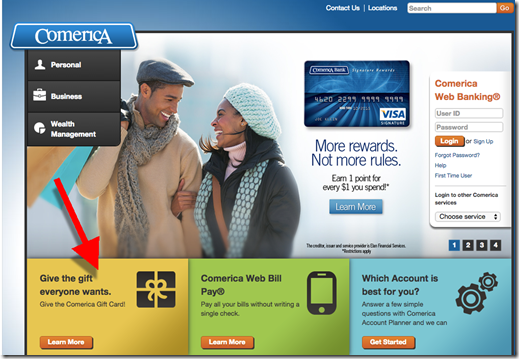 The promotion is designed to get Webster customers into the branch, or on the phone, for a financial checkup. The service appears to be free of charge, although the bank doesn’t reveal specifics. Customers are asked to complete a contact-me form (see second screenshot below) with just a single qualifying question, whether the appointment is to discuss business or personal finances. While Webster was the only FI playing the “new year resolution” card, South Florida Federal Credit Union gets an honorable mention for its timely Happy New Year graphic, one of four rotating promotions running at year-end (see last screenshot below and inset above). The end of the year provides a unique challenge to banks. Customers are busy buying gifts, finishing year-end projects at work, and preparing for holiday travel, meal prep and/or extended family time. There isn’t an abundance of deep thought about long-term financial plans, other than how to pay down inflated December credit card bills. This is not a tall order, yet only 9 of the 20 largest banks managed to do even 1 of the above 5 during the week leading up to Christmas. While that may not seem like a great performance, it was more than double the measly four last year. And it’s back in line with historical norms of 9 banks 2013; 8 in 2012; and 10 in 2011. It looks like 2014 was an anomaly. Congrats to PNC Bank, which once again, proved it was the holiday champ thanks to its long-running 12 Days of Christmas Index, earning a full 5 bulbs on our 1-to-5 light bulb scale. 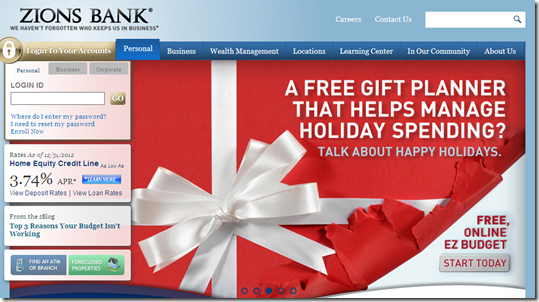 Runner-up Key Bank moved up to an impressive 4-bulb performance with four holiday promos. And we had three 3-bulbers (Fifth Third, BMO Harris, Union Bank) who posted impressive holiday graphics. Bank of America; Bank of the West (BNP Paribas); BB&T; Capital One & Capital One 360 (formerly ING Direct); Chase (note 2); Citizens (RBS); HSBC; SunTrust; US Bank; Wells Fargo; Zions Bank. Following is a quick overview of the promotions, including a 1- to 5-bulb rating. Previous year-end holiday posts: 2014, 2013, 2012, 2011 (big banks), 2011(CUs/community banks), 2009 part 1, 2009 part 2, 2007, 2006, 2006, 2004. 1. Observations taken between 7:00 a.m. and 8:00 a.m. Eastern Time on Wed, 23 Dec 2015, from a Florida IP address, running Mac Chrome browser with cookies cleared. 2. Chase is running a series of newish articles/posts below the fold, one of which covered holiday budgeting. But it wasn’t prominent enough to move them off the scrooge list. 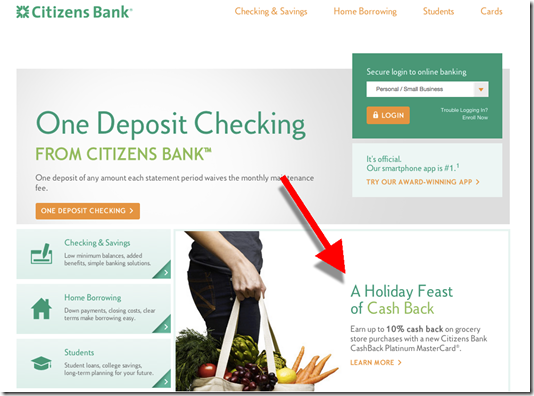 For the past 10 years, I’ve done a year-end post looking at holiday promotions at the largest U.S. banks. And surprisingly, fewer banks than anytime since 2004 were running holiday messages in the days before Christmas. 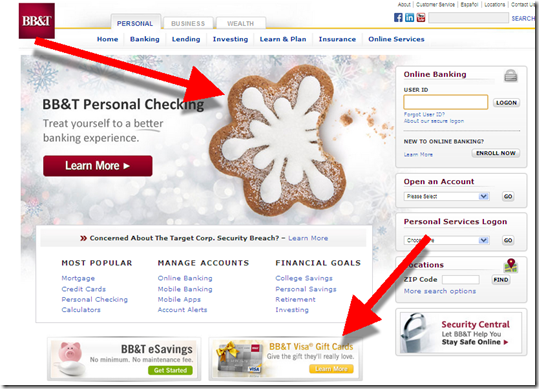 This year, only four of the 20 largest banks referenced the holidays on their homepages. That compares to nine banks last year, eight in 2012, and 10 in 2011. I’m at a loss to explain the retreat. My guess is that holiday promotions simply don’t drive measurable sales lift. But these are massive retail banks and I’d think that virtual holiday decorations would be in the branding budget. Perhaps that, too, was tapped out by year end. 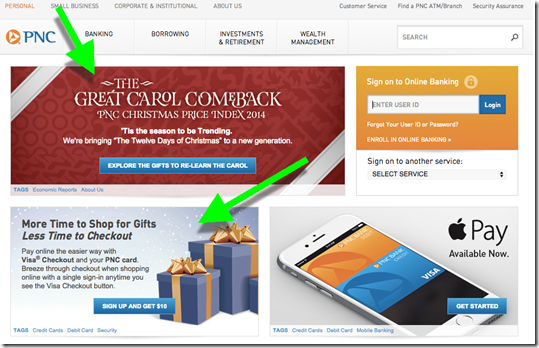 As usual, PNC Bank led the pack with its three-decade-long holiday CPI (Christmas Present Index). Fifth Third and Comerica were reasonably decked out for the holidays. Finally, Citizens (RBS) had a small holiday message in the lower right (see screenshots below). 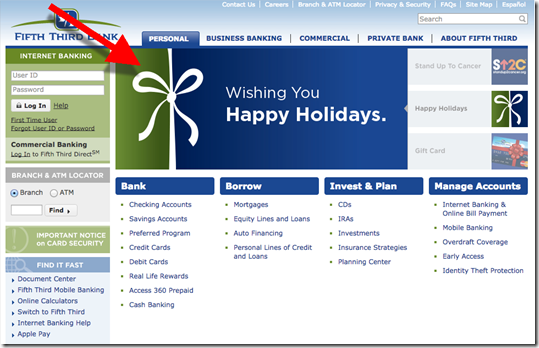 While we catalogued only the top 20, many other banks and credit unions displayed creative holiday promotions and/or messaging. 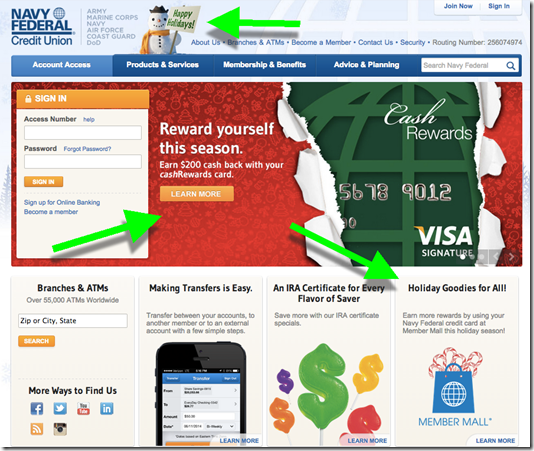 For example, Navy Federal Credit Union featured several holiday messages on its homepage the day before Christmas Eve (see screenshot) and Huntington Bank used an eye-catching graphic to pitch its rewards card (screenshot below). Bank of America, Bank of the West (BNP Paribas), BB&T, BBVA Compass, Capital One & Capital One 360 (formerly ING Direct), Chase, Citibank, Harris Bank (BMO), HSBC, Key Bank, SunTrust, TD Bank, Union Bank (Mitsubishi UFJ), US Bank, Wells Fargo, Zions Bank. 1. Observations taken between 6:30 AM and 8 AM, Eastern Time, on Wed, 24 Dec 2014, from a Florida IP address, running Mac Chrome browser with cookies cleared. 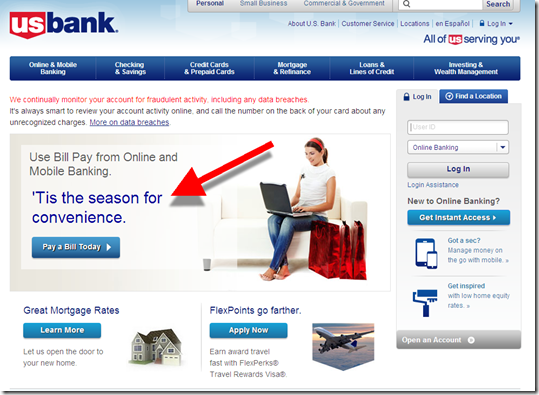 Banks have ratcheted up the design aspects of their websites substantially during the past 18 months. 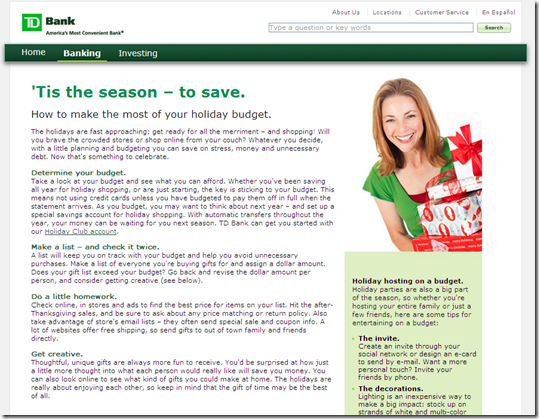 But in my annual look at holiday website designs, I found little change over past years. 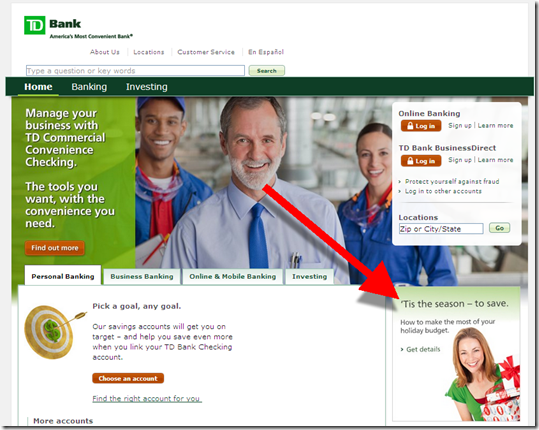 Only nine of the 20 largest U.S. banks displayed any holiday graphics or promos this year. That’s one more than last year, but still one less than 2010. 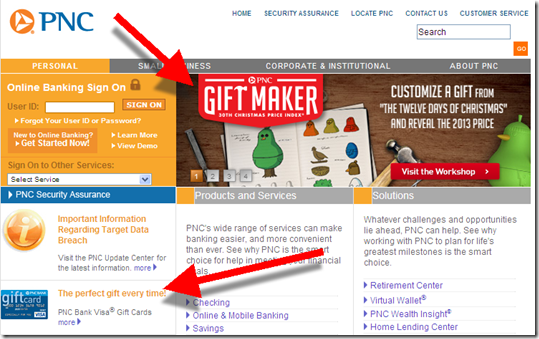 Once again PNC Bank led the pack with its three-decades-long holiday CPI (Christmas present index). 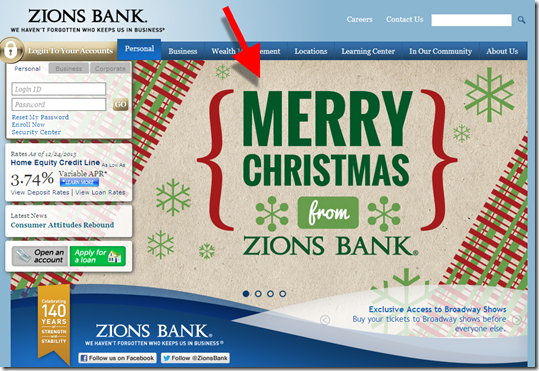 Zions Bank and Comerica (with the same promo as last year) were decked out in full-screen holiday graphics. 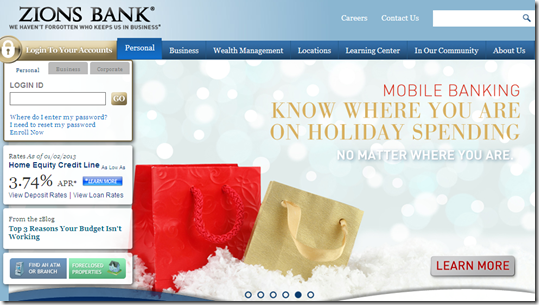 Union Bank, BB&T, US Bank, TD Bank and Wells Fargo also displayed notable holiday imagery. Chase just hinted at the holidays, earning a single bulb. 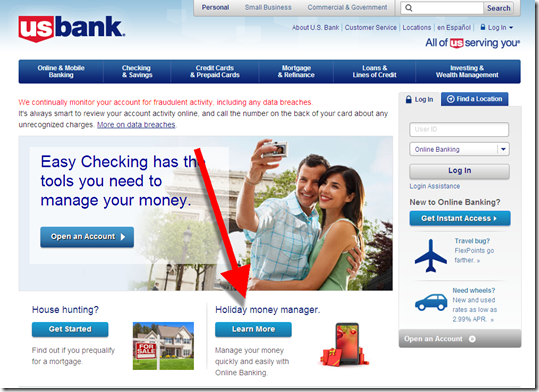 Many smaller banks and credit unions post creative holiday imagery. 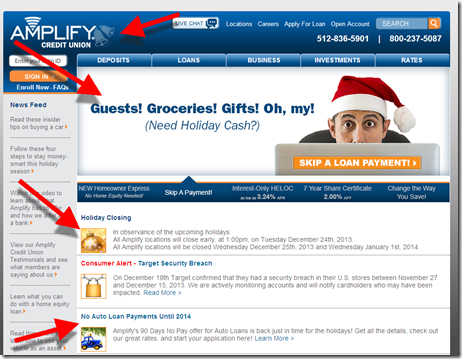 For example, Austin, TX-based Amplify Credit Union ran four holiday elements on its hompage on Christmas Eve (see last screenshot). 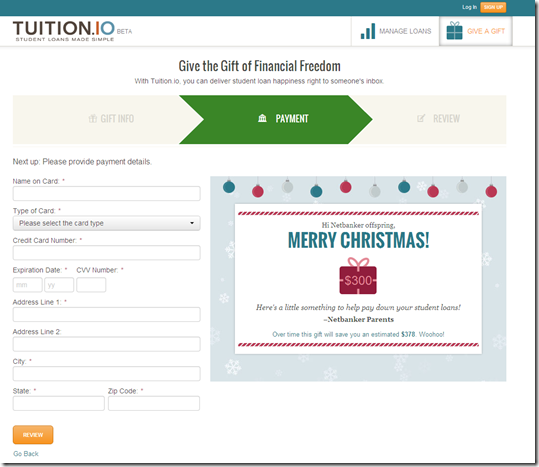 This time of year I’m always on the lookout for financial companies doing something interesting for the holidays. Gift cards are the obvious opportunity, but there are other financial products that make good holiday gifts as well (stocks, mutual funds, savings bonds, and so on). 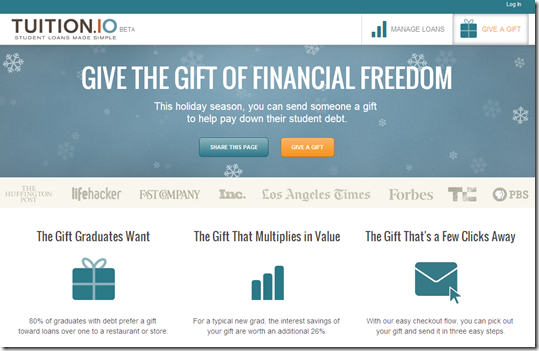 But it took a startup, Finovate alum Tuition.io (see FinovateFall 12 demo), to come up with one of the most valuable gifts yet: student loan repayment. It’s not as exciting as $100 to blow at Nordstrom (note 1), but the long-term value is pretty enticing, especially if the former student gets a number of them over the years. And it’s the perfect gift from grandparents or aunt/uncle who probably don’t have a clue what gift card to choose anyway. It’s as easy as sending an electronic Applebee’s gift card. 1. 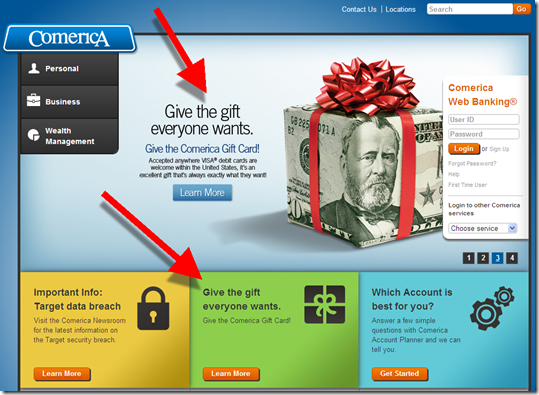 The giver completes a simple form naming the recipient, amount (from $5 to $500), date of delivery (email) and custom message (see screenshot #3). 2. Payment is made via credit card (screenshot #4). 3. 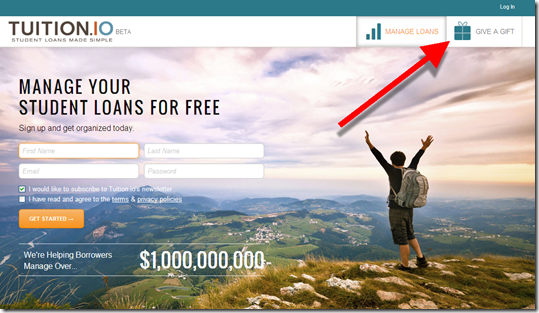 Recipient redeems by providing student loan info to Tuition.io. A. Neither the giver nor recipient need have a previous relationship with Tuition.io. B. 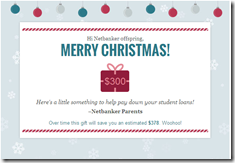 The gift can be used only for principal reduction, not monthly payments. D. If the recipient does not redeem before the expiration date, the money goes back to the giver, less the transaction fee. This has great potential for banks. A simple form to deposit cash or pay down bank loans/cards is a welcome service for holiday, birthday and graduations. 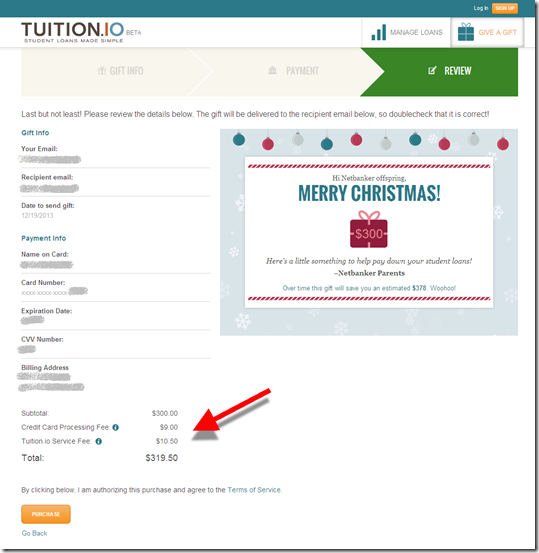 The Tuition.io is nearly a perfect example of how to build one. The only serious weakness is lack of disclosure of the 6.5% transaction fee until the last screen. While $19.50 to send a $300 repayment is not outlandish, it leaves a slightly bad taste when disclosed so late in the process. Why not be upfront with it? It would just add to the credibility of what the startup is doing. 1. We usually package a small retail gift card with the student loan payment, so it’s not completely boring. Before we move on to more weighty matters, here’s one last example from Holiday 2012. 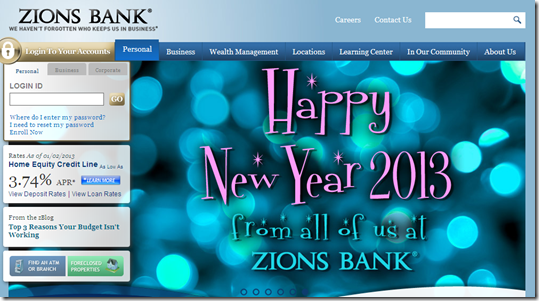 Zions Bank had the most decked out website we’ve observed in the past two weeks. Because it ranks just outside the 20 largest U.S. banks, it didn’t make last week’s holiday roundup. But since it was so decked out, I thought it was worth a followup. 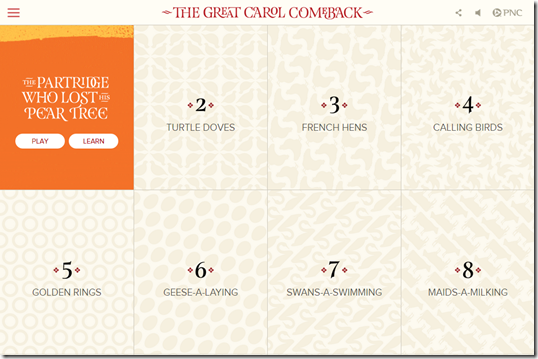 On New Years Day, Zions had holiday-related messages playing on three of its six rotating homepage themes. Bottom line: Without breaking the bank, Zions projects a timely, modern look that supports its brand.